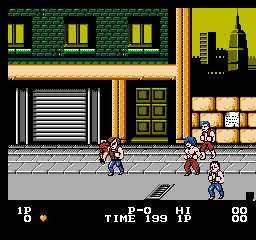 Double Dragon is one of the most popular arcade-style action fighting games ever, and has been used as a classic model for subsequent beat'em-up games. Published initially as an arcade title only, it's huge success has allowed the game to be converted across multiple platforms. 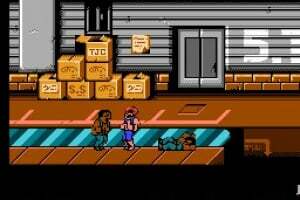 Double Dragon tells the story of two brothers, Billy and Jimmy Lee, who start a journey in order to save Billy's girlfriend Marian. The girl has been kidnapped by the Black Warriors, a gang of martial artists that are trying to learn the secrets of the technique SouSetsuKen, mastered by the two brothers. 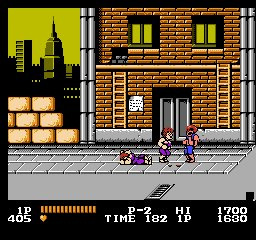 Double Dragon features offers a deep combat system based on punches, kicks and many weapons and interactive items. Moreover, the story will take the player to visit and explore many different locations, from the city suburbs to the mountains. YES!!! THANK YOU! I absolutely LOVE the original. I am so downloading this the day its released. 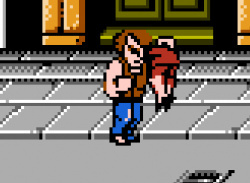 How awesome would it be if we got this with River City Ransom on the same day? OH YA! i remember playing this!! it was really short but totally awesome! Great game that happens to be very different from the arcade version. 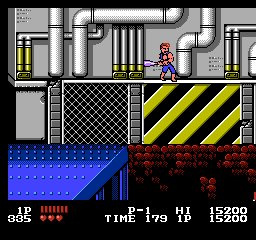 Double Dragon is one of the first Nes games I ever played. Double Dragon is a must have game for people that like beat'em ups. I never played this, but I love Super Double Dragon. I'll download this once it comes. Don't give us the third one! Anyone remember Bimmy and Jimmy? I would rather have the Master System version than this one, but I doubt they'd release both. Oh well - take what you get, right??? 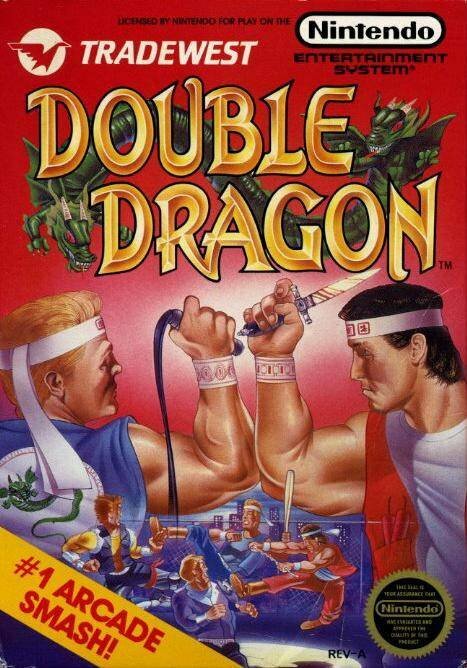 You can't play simultaneous, so I'm gonna wait for an other Double Dragon! Oh my God... How many times have I seen that girl get punched in the gut!? I'm totally getting this! 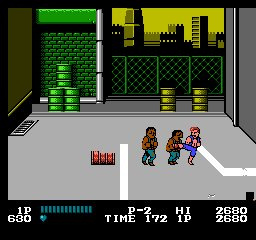 Which game is better, this or River City Ransom? They're not comparable, really, one is straightforward while the other is open-ended and more of an RPG. I would say RCR is more enjoyable than Double Dragon these days though. An absolute download!!!! Wouldn't mind seeing the master system version either but I doubt they would give us more than one version of the same game. I think River city is better, but this game is also good. The original promotional posters say Billy and Jimmy were called Hammer and Spike. LOL i dont know which sounds better.. I rather have Super Double Dragon on the SNES! Was this the one with the super knee where you hit A+B when recovering from a jump?? That move was that funniest thing in a side scolling beat em up ever. Or was that DD2?? Either way it had me in stitches, the way it smashed people across the screen. "How awesome would it be if we got this with River City Ransom on the same day?" Heh heh. Time to beat up some Abobos!! You got the plot wrong, guys - in the NES version, Shadow Boss' identity was actually Jimmy Lee, since the game was 1-player only, and they wanted both brothers in the game. When the sequel came trucking onto the NES, that plot thread was completely ignored, though. Double Dragon for the Megadrive/Genesis instead please. I've been spoiled by the XBLA version of this... still a great arcade conversion though. The Wii shop write-up for this says 1-2 players in the summary and mentions co-op in the main synopsis - anyone with the points willing to check this out? In the main game you just take turns if playing 2 players. The only simultaneous 2 player action on offer here is in the VS mode. I honestly can't give this more than a 3. Removing co-op removes alot of the fun. Do you still jump by pressing two buttons at once? Absolute classic! Fingers crossed for DD2 on the NES too, that was my favourite of the lot. Even so, in the middle of the Wii shop page "Double Dragon features 2 player co-op". Naughty Nintendo if they're stretching definitions to get downloads. I was just wondering if they'd added co-op to rival the XBLA release. That's why I bought it. I thought that they'd either added it or that the VCR was wrong. Unfortunatly though, it is 2p. Just in VS.
Naughty Nintendo it is then. Even the C64 version had co-op! And leotards in purple and pink. No co-op kinda takes the double out of the title and everyone knows one dragon is cool, but not megacool like you know - double dragon! Ahh.. My brother and I love this game! a must download. Where's my other dream game, Mega Man 2? Corey: 50,000! You scored 50,000 points on Double Dragon? Lucas: I love the Power Glove. It's so bad. Corey: Yeah, well, uh, just keep your Power Gloves off her, pal, huh? I love the opening cutscene; those dudes know how to knock out a girl with style! The NES version sucked bad in comparison to the arcade. No 2p coop? No thanks. I'll definitely pick up Double Dragon 2 when it comes though. I agree, loved the arcade version and after playing that DD1 was a total disappointment on NES. It is disheartining that the NES left out the 2-player; However, as a stand alone game, it is actual quite fun. 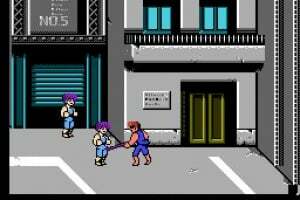 Hopefully, we will see the NES's version of Double Dragon 2. That is co-op and is a blast. It was one of the few games some of my friends, who didn't enjoy video games, enjoyed playing. The knee and spin kick could be touchy at times to pull-off, but if you failed, your partner was always there to back you up. 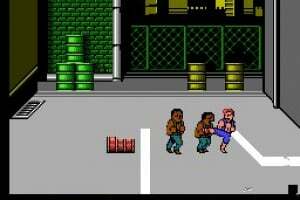 My buddies and I used to try and see how far we could get in the game with only using punches and jump kicks. No regular kicks allowed. It was great fun. I still remember beating the two Abobos in the third level and walking past the cave, causing the level to loop!! No two player co-op really kills this one for me. I must've played the Genesis version. The glory of this game was the co-op mode. And then after you beat the final boss you duke it out for who gets the girl. Gloriousness! deggs - Your reasoning is flawed. Just because Acclaim published DD2 and DD3 here and they're now out of business doesn't mean another company could pick up the rights, which is what was done here to begin with (DD1 was published by Tradewest). The publishing license is not the same as the intellectual properties. The NES version of DD2 was recently ported to mobile phones in Europe FYI. Finally made it to the last boss today (who, yes, is Jimmy Lee. 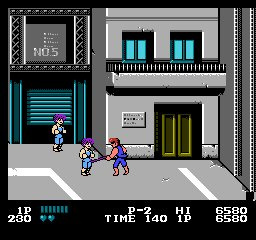 Willy's only his henchman here)- man, this game is much tougher than I remembered, and you pretty much have to rely on semi-cheap tactics in order to make it past some of the tougher sections. And the first part of level 4 with the moving pillars is a killer. Great fun, though. Yes, the lack of a co-op mode is annoying, but you get tremendously extended levels in exchange. A must play. I realy like this game. 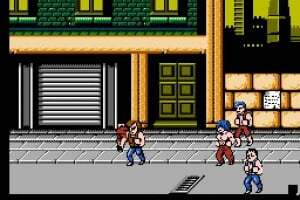 Cant wait for Double Dragon 2, one of my favorit beat-em-up game ^^. Aaand beat it. What a great game. Bring on the sequels, please. Those pillars in the beginning of level 4 is by far the hardest part of the game, though. Willy is a close second. I'll start by stating that I usually download NES games on a whim and a pint, I've found that very few have aged well enough to download, Punch Out and the Mario series being definite standouts as timeless classics. This game has aged well, and is still highly playable and fun. If you are a fan of the arcade game, then this might not do it for you, but it's still a great version of this classic game. I would recommend RCR over this, but DD is 500 points well spent. The SoR series is much better if you lack the nostalgia for this game and just want a great beat 'em up. I still can't get pass Mission 4 and those weird wall bricks that knock me down. I think this game's not that great. No two player? I'll stick to River City Ramson/Street Gangs. I had to decide between this and River City Ransom. I decided on RCR in the end though, since that game had Co-op and the RPG elements piqued my interest. I think I made the right decision. great game. good music and good controles. greeaaat game !! 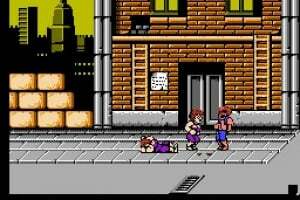 I waiting for double dragon II revenge too !! "deggs - Your reasoning is flawed. Just because Acclaim published DD2 and DD3 here and they're now out of business doesn't mean another company could pick up the rights, which is what was done here to begin with (DD1 was published by Tradewest). The publishing license is not the same as the intellectual properties. The NES version of DD2 was recently ported to mobile phones in Europe FYI." what i should have said was that to release this game, one would also have to go through similar efforts to release super double dragon so if this one is releasable, then so is super double dragon. dd2 and dd3 would require clearing things with different people. that doesn't mean that it is impossible that they would ever come to vc. However I'm still waiting for the sequels!!!!!!!!!!!!!!!!!!!!!!!!!!!!!!!!!!!!!!!!!!!!!!!!!!!!!!!! ^About the SMS port. . . But I think I have the old DD SMS cart somewhere..
Not as good as RSR, but still oaky. I only bought this because I want to say that I played through and beat it. Its a big piece of gaming history but it is very rough around the edges. DD2 is by far my favourite in the series and I would love to add it to my Wii menu. So I'll play through it, get frustrated with the weird difficulty, and then add it to my trophy room of completed games. Good enough. Even though this game didn't come with the co-op, it was still fun its own right. 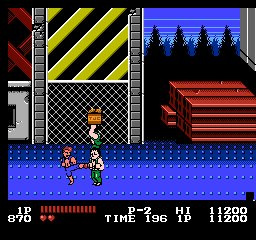 NOW, if we could only get the Nes's version of DOUBLE DRAGON 2, then the world would win. Its that INCREDIBLE FILM ...The Wizard! "You scored 50,000 points on Double Dragon!??!" 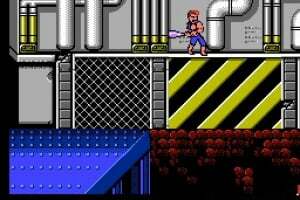 I wish they'd release the Genesis version of Double Dragon, I love that game so much. 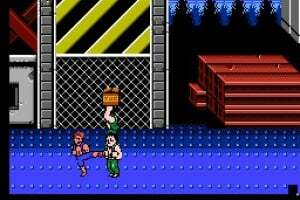 god i love this game, but guess what I LOVE DOUBLE DRAGON 2 EVEN MORE!!! QUIT SLEEPING NINTENDO AND SEND US IT NOW!!! ^^ Amen!! Double Dragon II was the best of the entire series. Please give us the rest of the double dragons. I'd download DDII and III the minute they're available. All three of these games are must-haves for any serious nintendo collection. when are they releasing the arcade version?? When my big brother and I were little, we played co-op on this game. We rented it. 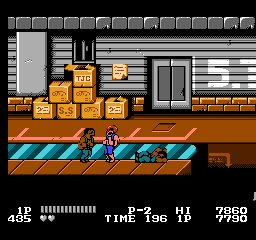 Anyway, I remember that we didn't get very far on the game, but we eventually did beat River City Ransom (then again, we bought that, so we had more time). Should I get this on the VC, or do you think it might be too hard?